Compile a list of relevant search terms. Analyze your domain’s organic traffic. Assign keywords to specific pages on your website. Monitor your keyword performance and adjust accordingly. SEO keyword research requires you to have a basic understanding of your organization, products or services. Whether you’re starting a new AdWords campaign, or you’re interested in enhancing your SERP visibility, the first step is identifying the most relevant search terms for your audience. What are your customers searching when they need your services or are interested in your products? List words or phrases that represent what your organization is advertising. Enter one of your keywords into Google Search and then scroll to the bottom of the page to view related search terms (see image, below). Put together a list of basic keywords that directly relate to your business before you get started with the Google keyword research tool. Our team performs a comprehensive site audit and organic traffic analysis to determine which keywords your domain is currently ranking for and what opportunities are present. We recommend that you set up Google Analytics tracking on your website in order to gather a current snapshot of your organic visitors. This data reveals the specific search terms which is driving traffic to your domain. Analytics provide valuable insights into how well your site is performing on SERPs, including specific keyword ranking stats. 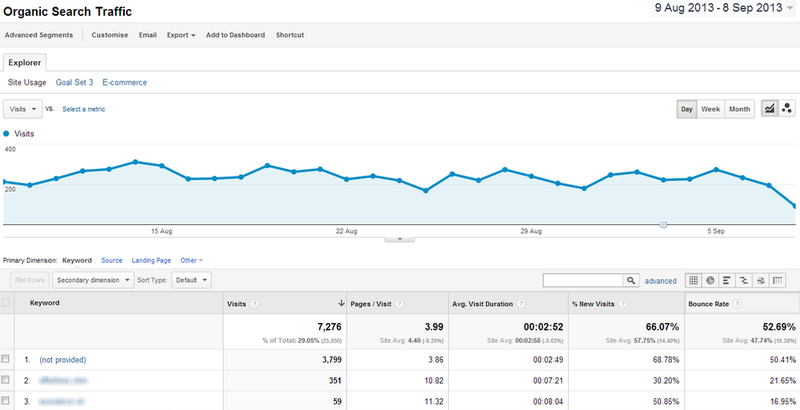 Learn more about using Google Analytics for SEO keyword research. 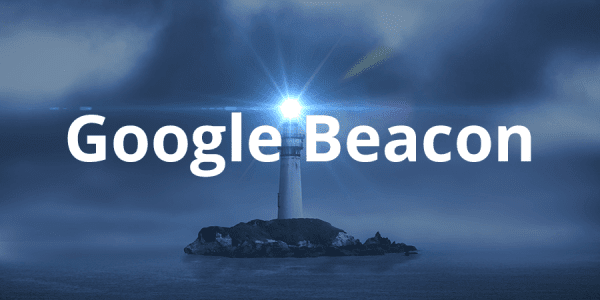 It is also recommended that you link Search Console to AdWords. Now that you have some traffic insights and a list of keyword for which you’re interested in optimizing your website, it’s time to learn how to do keyword research using the official Google keyword research tool, Google Keyword Planner. You are required to have a Google AdWords account — even you don’t plan to create any advertising campaigns — in order to use the free Google keyword research tool. Log in to your Google AdWords account. 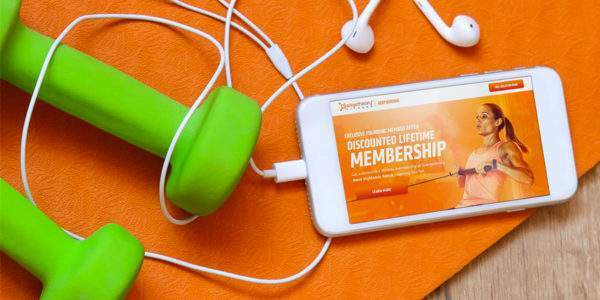 If you don’t already have one, click here to learn how to create one for free. 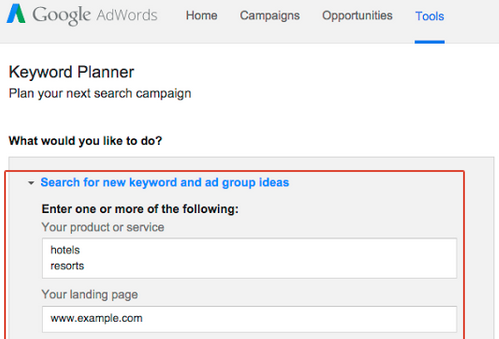 Click the “Search for New Keyword and Ad Group Ideas” drop-down. Enter the keyword search terms you compiled, above, on separate lines in the “Your Product or Service” field. Blennd – Request custom-tailored keyword research from our expert team. Google Keyword Planner – Free Google keyword research tool. MOZ.com – Powerful keyword research and campaign tracking tools. SERPs – Keyword research and tracking for multiple devices, locations and search engines. Ahrefs – Ahref’s updated guide for how to do keyword research. If you entered a specific landing page in the previous step, rather than manually entering your list of search terms, then the keywords listed on the ideas tab are already recommended to be associated with your landing page. That is, you’re more likely to rank for these keywords if you optimize the content using those terms on the related landing page. If you didn’t enter a landing page, you can manually assign keywords to each page on your site. For example, if you’re a flower shop, you may assign “buy flowers online” to your Home page while assigning “Denver flower shops” to your Locations page. It’s important to rank each keyword only one time on your site. If more than one page is ranking for the same keyword, this may negatively impact your SERP rankings. Now that you’ve completed the initial keyword research for your domain, you’ll want to keep monitoring your performance. Google provides some performance information and traffic forecasts for you to leverage while implementing your keywords into the content on your website. We recommend connecting your Google Analytics account to your AdWords account to deliver enhanced traffic insights. For industry-leading strategies, comprehensive keyword monitoring and the latest digital marketing trends, contact our team of SEO experts at Blennd. At Blennd, we leverage a wide-range of SEO keyword research services to gather a more accurate snapshot of our client’s SERP rankings. We perform extensive keyword and topic research to create highly-effective organic marketing strategies. Our Denver search engine optimization team is proud to have facilitated significant growth in organic traffic to each and every client we work with. Weather you already know how to do keyword research or you’re just learning about SEO for the first time, our team can provide you with the data and results your organization deserves. Work with us today!